Santorini is the site of Southern Europe's only active volcano outside Italy. It last erupted in 1950. The island is believed to have given rise to the legend of the "lost" continent of Atlantis in Ancient Greek mythology. A catastrophic eruption around 1545 BC destroyed the local settlements on the island and created a tidal wave which wiped out the Minoan civilisation on Crete, more than 70 miles away. The eruption created a huge caldera as the central section slid below sea-level. This has produced a spectacular setting with high cliffs forming the rim of the caldera. New volcanoes have developed which now form islands in the centre. The older basement rock of marble is exposed in places forming steep hills. There are also sites of mineral deposits and hot springs. 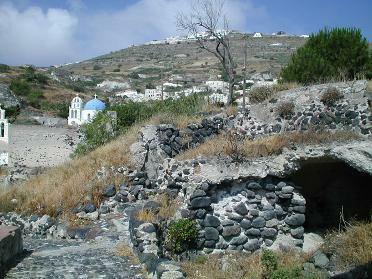 The island contains a wealth of archaeological remains in places such as Akrotiri and ancient Thira. All excursions will be escorted, making some use of local guides who have specialist knowledge of the archaeological sites of the area. The visit is open to all adults. The party will be led by Alan Clewlow, an experienced geologist who will be on hand to offer advice and some explanation of the features seen and guidance around the area. It will also offer a superb opportunity for photography. The one-week visit will also give the chance to spend some free time, which could be used to explore the nearby island of Therasia, spend time in the bustling main island town of Fira, or view the scenery in some of the more remote corners of the island. Leave London Heathrow on direct morning flight to Santorini. Transfer by coach to 4-star hotel in the beach-resort of Kamari. Introductory talk before dinner to discuss the week's activities. A coach will take us to various sites on the island, starting with a visit to the old village of Mesagonia, largely evacuated after a major earthquake in 1956. We then journey down to the south-western tip of the island, where the oldest volcanic rocks are found. From here the structure of the caldera can be clearly seen. We continue to Akrotiri. This Bronze-age city was buried by deposits from the Minoan eruption of 1545 BC. The main excavations are closed at the moment, for safety reasons, but there may be some access to parts of the site. After a lunchtime stop at the old town of Pyrgos with its Venetian Fortress, our coach climbs to Profitis Ilias, the highest point on the island at 566m. From this mountain of marble can be seen the whole island. From here, people have the option of following the mountain footpath back down to Kamari, or returning to the hotel by coach. We travel to the port of Athinios, where we board a boat which takes us to the two volcanic islands in the centre of the caldera. We land on Nea Kameni ("New Burnt Island") which was first created in the 18th Century. It erupted several times in the 20th Century and is constantly monitored for signs of new activity. We will make the short 15-minute climb to its summit and look at the main crater and recent lava-flows. We then take the short trip to Palea Kameni ("Old Burnt Island"), where there may be the opportunity to bathe in the hot springs. The boat continues to the island of Therasia for a lunchtime stop. After this, the boat will take a trip around the western part of Thira island, with a chance to see the many structures in the caldera-wall from below. We take the local bus to Fira, the island's main town. It has been largely rebuilt after the devastating earthquake of 1956. First stop will be the Prehistoric Museum, which houses many of the best finds from the excavations at Akrotiri, including some superb 3500 years old wall-paintings. Following this, there is the opportunity to take a closer look at the pumice and other deposits from the Minoan eruption, then a steady walk along the cliff-top path above the caldera to the old town of Imerovigli, with superb views of the harbour and cliffs below, and to the precipitous cliffs at Skaros, the site of a medieval fortress. A coach-ride to Fira, with some free time in the town and a visit to the classical museum, where the Ancient Greek and Roman collections are housed. We then journey to the cliffs above Athinios, followed by a walk down past the whole section through the volcanic deposits. Close to sea-level can be seen the pre-volcanic basement rocks of marble and blueschists, which have been mineralised to form metal ores and talc. There are also hot springs in the area. A morning walk from the hotel to view the well-preserved remains of the settlement of Ancient Thira, perched on a rocky promontary high above Kamari and dating back to 800 BC. The walk follows a minor road which zigzags over the Tertiary marble, covered in places by pumice and bombs from the Minoan eruption. Later in the afternoon we take a coach to old town of Oia on the north-west tip of the island, where crowds gather to watch the sunset, from the clifftop. Short coach-ride to airport for direct return flight to the UK, arriving at London Heathrow late afternoon. The cost of the visit is £985 per person. This includes flights from London Heathrow to Santorini (Thira) and return (and airport taxes), coach transfers and local ferries on the itinerary listed above. Included in the cost is accommodation in the 4-star Venus-Aphrodite hotel in Kamari. Accommodation is booked on a bed & breakfast basis, but it is anticipated that the group will want to eat together for dinner in the evenings. A suitable venue will be suggested for this purpose (a local taverna) each evening, thus allowing people to eat at a variety of establishments and choose whether or not to eat with the group. Accommodation is based on two people sharing a room. It should be possible to arrange single rooms for those who require it, but this will involve a supplement. All those taking part in the tour are expected to arrange their own holiday insurance, which can be obtained from any travel agent or insurance broker.